When you live near the coast you eat seafood. When you camp near the water you want seafood. 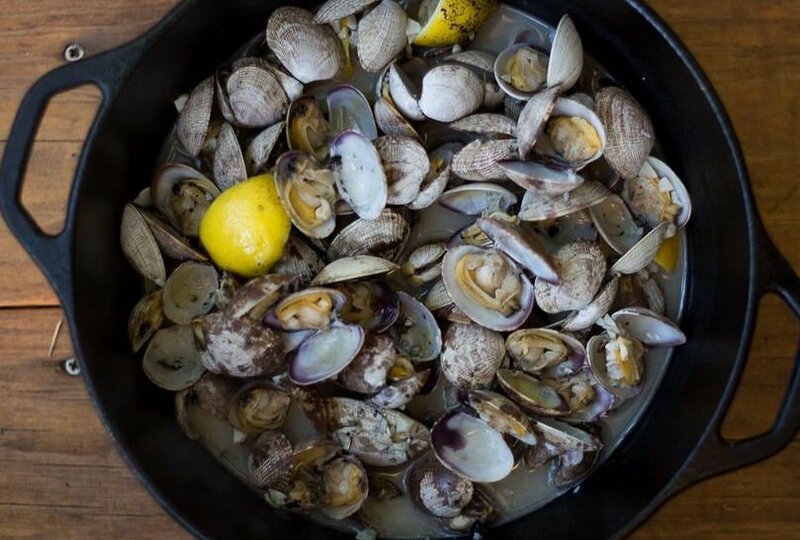 So with that in mind today’s recipe is all about seafood, more specifically beer and clams. This is a simple recipe that requires two very important ingredients. Fresh good quality clams and beer. The better the beer the better the end result will be. There are a few other items you need to cook the clams but remember FRESH clams and good beer! You will need a dutch oven with a lid, a few tablespoons of butter, one lemon and a bunch of garlic. Throw everything in the pot with the clams, cover, and steam for 6-8 minutes, until they open. It’s a good idea to have a loaf of bread on hand to dip into the sauce while you eat. Fresh made Italian or a dense French bread work the best. They travel well and even if they get a little hard the sauce softens it up beautifully.